1. Whisk rice wine, oyster sauce and cornstarch in a small bowl until the starch is dissolved. 2. Heat 2 teaspoons oil in a large nonstick skillet or wok over medium-high heat. Add beef and crushed red pepper to taste; cook, stirring, until the beef begins to brown, 1 to 2 minutes. Add shrimp and continue to cook, stirring, until the shrimp is opaque and pink, 1 to 2 minutes. 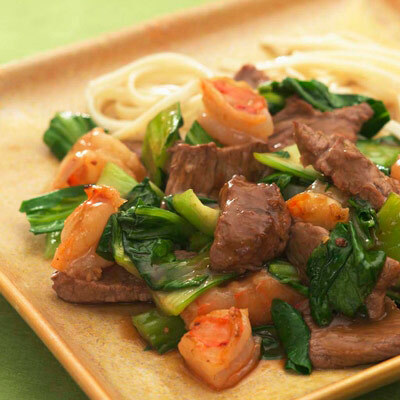 Transfer the beef, shrimp and any juices to a plate. 3. Heat the remaining 2 teaspoons oil over medium-high heat in the same pan. Add bok choy and cook, stirring, until it begins to wilt, 2 to 4 minutes. Stir in the cornstarch mixture. Return the beef-shrimp mixture to the pan and cook, stirring, until heated through and the sauce has thickened slightly, about 1 minute. 4. Serve over Paleo rice or soaked rice.